Although it is one of the most remote coastlines to reach for superyachts coming from the Northern Hemisphere, the unique attractions and experiences cruising South Australian waters make it a very special place to visit. South Australia is a destination worth visiting aboard a superyacht. Obviously the access to South Australian waters requires a passage through potentially challenging seas and caution should be exercised with route planning and picking an appropriate weather window to cross either the Great Australian Bight from the west or Bass Strait from the east. This coast is, after all, the northern part of the one of the most notorious bodies of water for weather in the world; the Southern Ocean. The best time to visit South Australia is from October to April during the Australian summer months. Describing the coast from west to east; a quiet fuel stop with a protected anchorage can be found at Ceduna where its famous fresh oysters are available in season up to April. The Nyts Archipelago is a string of small islands extending to the southeast. Good anchorages are possible off the northern beaches of St Francis and Franklin Islands. Guided fishing is available from Ceduna Boat Charters (www.cedunaboatcharters.com.au). Snapper, Australian Salmon and the famous King George Whiting are found here in abundance. Heading south, safe anchorages and 360 degree protection can be obtained in Streaky Bay and interesting stopovers can be made on the Pearson Islands for great photo opportunities and unusual rock formations and fauna. Coffin Bay also has a few good anchorages and fishing guides are available. Out of the bay to the southwest, be on the lookout for fish schools such as the Southern Blue Fin Tuna found south of Greenly and Four Hummocks Islands from about February to April. Rounding Eyre Peninsula, the good anchorages and some berthing and fuel is available in Port Lincoln, the home of a large tuna fishing industry. Tours can be arranged from here and air transfers to Adelaide are available with Rex Airlines. Awesome adventures to the Neptune Islands to cage dive with great white sharks depart from Port Lincoln. The Calypso Star (www.calypsostarcharter.com.au) has taken divers from all over the world to see these awe inspiring creatures one on one. For superyacht owners who are keen scuba divers, their diving experiences around the world will not be fully complete until they have dived in a shark-proof cage with one of the huge great white sharks found in abundance in South Australia. The Neptune Islands were the location for the real shark scenes from the film ‘Jaws’. This fact should also be kept in mind by keen deckhands and bosuns wanting to get in the water to clean the waterline or polish the prop while at anchor in these waters – don’t! It is quite common to see these monsters when at anchor, usually near a seal colony, menacingly sliding under the hull on the prowl for seals or human-sized lookalikes! Heading east, one of South Australia’s tourism jewels, Kangaroo Island, provides numerous scenic anchorages on its northern side. Emu Bay, Kingscote and American River are the most protected. All types of accommodation are available on the island and tours of the island’s flora and fauna attractions can be easily arranged. A 20 NM hop across Backstairs Passage towards Adelaide finds another good anchorage at Rapid Bay, famous for its marine sanctuary and the Leafy Sea Dragon. A good marina called Sunset Cove Marina with berths up to 40 metres is just adjacent this bay. 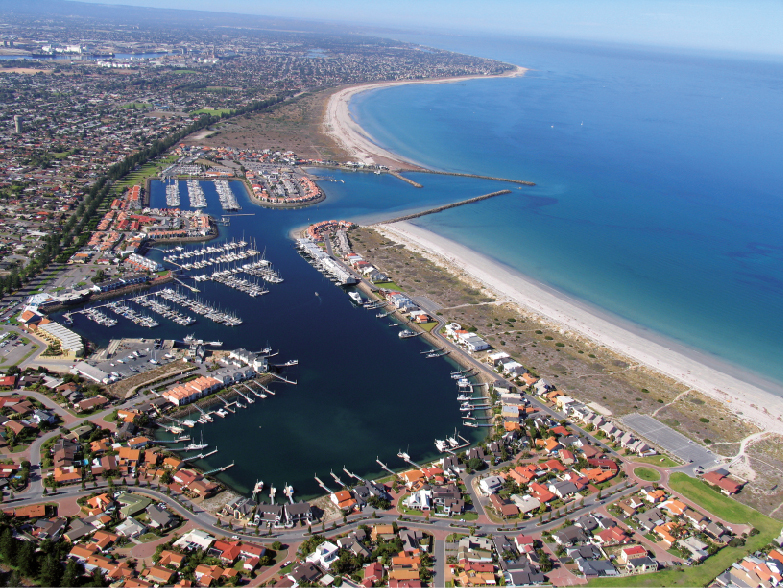 This spacious marina, which at first seems to be in a strange location, provides good access to the famous McLaren Vale wine region and Fleurieu Peninsula. Diving tours on the wreck of former Navy destroyer HMAS Hobart can be arranged from here. 50 NM to the north is the entrance to Port Adelaide. Commercial wharf space, fuel and a number of new 40 metre yacht berths are available at the Royal South Australian Yacht Squadron. This provides road access to the world famous Barossa Valley wine region, home to many famous labels such as Wolf Blass, Yalumba and Seppelt, and the attractions of Adelaide city. Fuel is also available from North Haven Marine and Fuel Supplies. Vessels planning to head east should watch for a decent weather window as the next major port from Adelaide is Melbourne, although there is a possible bad weather shelter at the commercial port of Portland on the Victorian Coast.